Now, Little Brian Stelter over at CNN — he’s their media analyst. He’s the guy that does reports on how well the media’s doing for CNN. He’s the Howard Kurtz, if you will, of CNN. And I guess that Brian is upset that I am not taking a leadership position with you in this audience in the effort to get rid of and bury Roy Moore. Brian is terribly upset that I have fallen back on my identifier as an entertainer and that I am shirking my obvious leadership role. He said it this morning on CNN’s New Day. By the way, CNN right now, two more women say Roy Moore made unwanted overtures. And before that, CNN did a half hour forum on tax reform. You can’t find the Al Franken story on CNN. It’s been there, I’ve seen it for scant seconds go by during the morning, but they’re not focusing on it at all. So here’s Brian Stelter this morning on CNN worried about me. STELTER: The cliche that I see a lot of commentators holding on to. “Hey, this isn’t up to me; it’s up to the voters.” Well, actually people like Rush Limbaugh, like him or not, they’re viewed as leaders in this conservative media world. They are viewed as leaders by people like President Trump. We know that the president takes advice from these voices on the radio and television. So I know they’d prefer to be entertainers, prefer to let the voters decide, but we’re actually not seeing a lot of leadership from these hosts, from these commentators, which is notable, given that Mitch McConnell and Paul Ryan and other GOP leaders have spoken out. These hosts are accountable every day to their audience. They look at the ratings. They look at the page views. Maybe they’re concerned that they don’t know where their audience stands on this issue. RUSH: Brian, one thing, Brian, of everything here. If you forget everything I say, remember this. I always know where my audience is issue to issue to issue to candidate to candidate to candidate. I always know where my audience is, Brian, that’s why I am where I am. Plus, Brian, I have an audience to know where they are. Many people don’t. Many people think they have an audience but you could put ’em in a thimble, maybe a phone booth. There aren’t phone booths anymore, but conjure your memory. No, seriously. He obviously has been waiting for me to jump in on the “condemn Roy Moore.” And I haven’t done it sufficiently for these people, so I am abrogating my responsibility. I am falling back on the fact that I’m just an entertainer, that I have no business telling you people what to think on this issue, and I have a duty to assume that leadership role and tell you what Brian Stelter and CNN want to hear me say. He’s worried about me. It’s compassionate. Okay. You know, I’m thinking here, Brian, of what I can do to maybe get back in your not good graces, but at least assume this leadership role. Let me do so in the Franken instance. Let me tell you what you ought to do. Brian, you need to make sure this story doesn’t get short shrift at CNN. If you guys hope to get rid of Roy Moore, you’re gonna have to focus on Franken and you’re gonna have to show that picture and you’re going to have to condemn it. You’re gonna have to condemn it with no doubts about what you’re doing. You’re going to have to condemn Franken’s behavior. You are going to have to universally accept the words of Leeann Tweeden. You are going to have to demand that the Democrats do something about this guy because he poses a great danger to women and the Democrat Party and the objective to win back the White House. So as leader, as the Mister Big in the vast right-wing conspiracy, Mr. Stelter, what you need to do is to convince the Democrats to throw Franken overboard. The Democrat governor of Minnesota will appoint another Democrat in his place, and you will not miss Franken, and you will not have a hypocrisy problem. You can do it by the end of the week. It will give you and the Democrats cover for anything you can and will and want to keep doing to Roy Moore. But if you want to keep going after Roy Moore and if you want to then turn your attention to Trump, you have got to throw Al Franken overboard. You have got to convince your friends that Franken is nothing in terms of the overall quest of the Democrat Party. If you defend him, if you in any way try to differentiate what Franken is alleged to have done with Roy Moore or Weinstein or anybody else, you will not be able to sell future attacks on other Republicans that you wish to destroy. There. How’s that? RUSH: It was a mistrial in the Senator Menendez case, and he’s now pontificating about what a wrong case it was, a bad trial, a bad prosecution, FBI out of control. He says (paraphrasing), “The FBI just refused to believe that a young Latino kid could ever amount to anything like U.S. senator and be honest.” So the FBI was running around asking people, “What do you have on Menendez? Give us anything, we’ll take anything you got on Menendez.” Mistrial mishmile. I have a question, ladies and gentlemen. How many Washington Post reporters are now swarming Hollywood and Minnesota looking for decades-old information on Al Franken? Well, they’re all over Alabama. They all got visas and they went into Alabama. They went hunting. Remember like John Kerry, “Is this where I get me a huntin’ license?” A bunch of reporters applied for hunting licenses in Alabama. The Washington Post even ran a robo-call operation asking for dirt on Roy Moore. They’re denying that, claiming they’re offended anybody would ever think they would run their operation like that. Right. Just how many Washington Post reporters anywhere are swarming Hollywood and Minnesota offering people to come forward with stories about Al Franken? ‘Cause, you know, we have to root out these people like we have to root out Roy Moore and perverts like that. How many of the Drive-By Medias are looking this uh? I’ll tell you what else, though. If what has popped up today about Franken just in a couple of hours, if that keeps popping up, you know, you’ve got now, what is it, Senator Schumer calls for an ethics probe of Franken, that’s a delaying — what do you mean, ethics probe? What do we need an ethics probe for? We’ve got a picture! We’ve got the evidence and we have the woman with the story, and the women do not lie! We’ll see how this shakes out, but I betcha we’re gonna hear a lot more stories of Franken ’cause they’re gonna be plentiful. Here’s Max in Houston. Max, welcome, great to have you on the EIB Network. Hello. 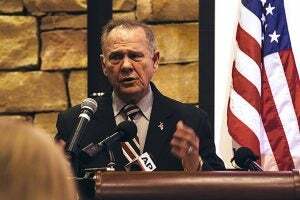 CALLER: — to prove that they are serious about condemning sexual misconduct so that they can burn out Roy Moore and they can use the Saul Alinsky tactic of the freezeout to go after Donald Trump and anything that he stands for. RUSH: Well, I have to tell you, I suggested to Brian Stelter today when he demanded leadership from me, he says I’ve been skating lately on Moore, that I have been relying on the fact I’m just an entertainer, he’s been demanding leadership. So you would think — but there’s a big difference in Republicans and Democrats. They do not throw their people overboard except if it’s the last option.